Oops! Better late than never. This month we made pho, which I love. 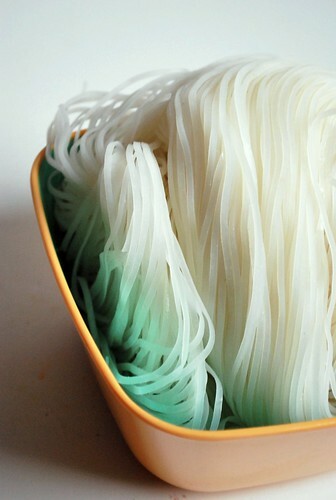 Pho is a Vietnamese dish of broth with rice noodles and meat, and you get to customize it to your taste. Served alongside is usually a plate of sprouts, lime, chilis, basil, and maybe a few other things. I added scallions, cilantro, and onion as well. The October 2009 Daring Cooks' challenge was brought to us by Jaden of the blog Steamy Kitchen. The recipes are from her new cookbook, The Steamy Kitchen Cookbook. Heat a pan over high heat. Add the spices and toast, shaking the pan so the spices don't burn. When you can start to smell them, they're done. 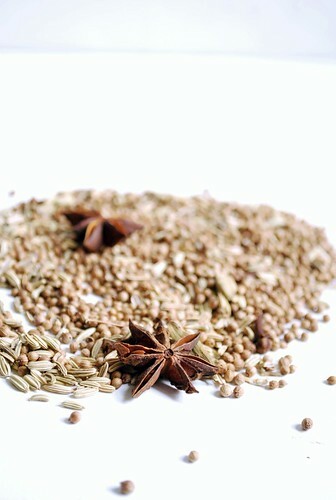 Remove them from the pan, then combine all the ingredients (including the spices) in a pot and cook for 20-30 minutes. Strain the broth, then keep it on a low simmer while you get everything else ready. Cook the noodles according to your package directions. 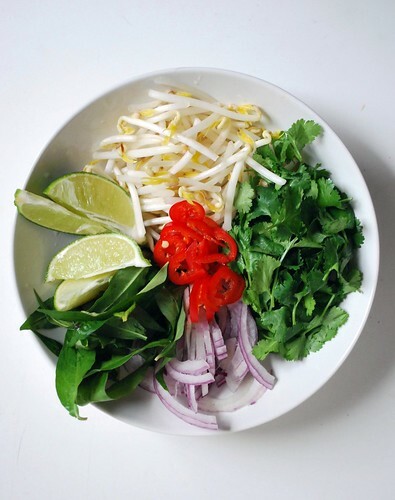 Arrange the bean sprouts, cilantro, basil, onion, lime, chilis and scallions on a plate. Divide the noodles between bowls, top with sliced meat, then pour the hot broth over. The broth will help cook the beef. Add whatever additions you'd like, and enjoy! We were supposed to make a dessert wonton, but I didn't have time and also, us gluten-free people can't use wonton wrappers. I wasn't up to that challenge today. Not too late - Its still the 14th =D. Your pho looks amazing! Great job with this challenge!! looks good and easy too! yes GF wonton wrappers are definitely a challenge, especially after remembering the crazy time I had making the pot-stickers a few months ago - for this dessert I used rice paper spring roll wrappers for the wontons, which weren't ideal, but they worked! This looks incredible. I love pho but have only found one place in Chicago that does it really well and it's a bit out of the way. Making it looks to have a pretty highly rewarding outcome though admittedly I'm not sure where to pick up Thai basil. Wow, beautiful pictures and enticing pho! Yummy! You photos are amazing! Can I make this with shrimp? Great photos! I love all the colors in your pho. lovely job! 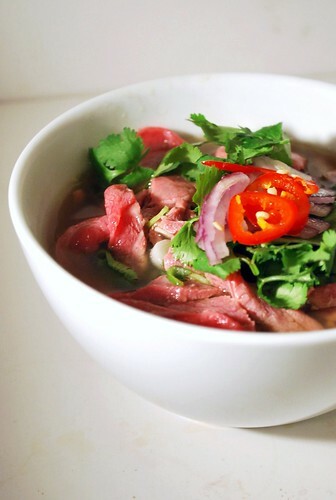 Gorgeous Beef Pho and stunning photos! I made the chicken, but seeing yours enhances my desire to tackle the beef. 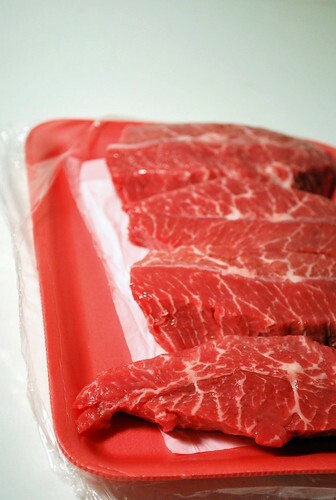 It looks so tender and rare..so much so, that I'm salivating. Well done!! Mmhammh!! yami. When I was little, my mom used to make this dish using leftover plain pasta. She added a lot of garlic, then the noodles, a little bit of soy sauce, and some oyster sauce. I loved it! Your photos put me to shame. I need to learn how to properly photograph.